Forget the hype about a shortage of supply. In its report today on existing-home sales in September – they fell by 4.1% from a year ago to the lowest level since November 2015 — the National Association of Realtors blamed inevitably the “decade’s high mortgage rates.” This is no surprise. The Fed has been hiking its policy rates, and mortgage rates have been rising for a while and now average over 5% for a 30-year fixed-rate conforming mortgage. While this may seem high by 2016 standards, it remains low compared to rates in the pre-Financial-Crisis era. Indeed, when home prices rise faster than wages year after year – in September too, the median home price rose 4.2% year-over-year to $258,100 – sooner or later, the choice of homes that are “affordable” to those worker bees having to make mortgage payments from their wages gets pretty thin. Inventory of existing homes for sale edged up 1.1% year-over-year to 1.88 million homes. Unsold inventory rose to 4.4 months’ supply. And this is where it gets interesting – because it breached a new line. Housing market players are relying more and more on technology to make the purchase of a home and the approval or a mortgage much faster and more efficient. What might have taken months can now be done in days. These technologies include online listings that are instantly viewable by everyone (rather than printed listings that took a long time to get to the potential home buyer), online research tools, drone-generated video of the home, automated income verification tools for lenders, automated credit approvals, and the like. These technologies are impacting every part of the market. And there have been big consequences. Technology has shattered the balanced market months of supply conventional wisdom, shaving roughly two months off the time required to sell a home. Homes can enter escrow today within 24 hours of listing, compared to prior periods when it took at least 30 days for the first open house. Under this scenario, the unsold inventory of 4.4 months’ supply in September is now a buyers’ market. If we’re right, nationally we’ve already entered the early stages of a buyer’s market. 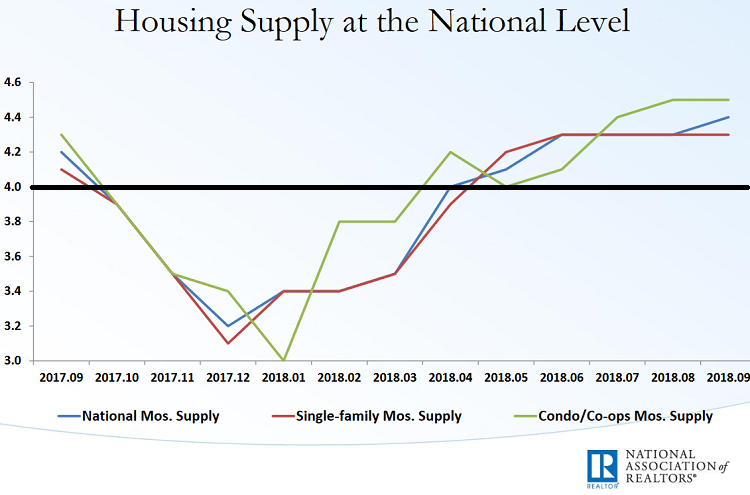 Should supply levels cross above five months we’ll be watching for flat, possibly declining resale prices in some markets, especially where affordability is already very stretched. So the beginnings of the buyer’s market, arrived gingerly at around April or May this year, based on national numbers. Real estate is local, and local results may vary, as they say, with some cities wallowing deeply in a buyer’s market and other cities still enjoying the endlessly sunny days of a seller’s market. But whatever there is, there is no shortage of supply, though there is, after years of rampant home-price inflation, a shortage of affordable supply. But that mismatch can be fixed by a drawn-out housing downturn.